If you have had the chance to start your search for the perfect backyard swing set you have by now discovered that there is a lot to choose from. The decision needs to be made whether you want wood, vinyl, or metal. You also need to consider the size and whether it will fit in your backyard. Another factor is the number of features and which activities are most important to you and your kids. And of course, there is always the matter of how much money you are willing to spend. 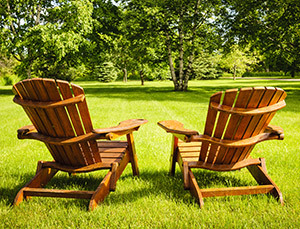 Wooden swing sets tend to be on the more expensive end of the range of prices, but are typically larger and more sturdy. Metal swings sets are normally cheaper but do not usually come with a clubhouse or any type of enclosure. If you are in the market for a swing set, but are also hoping to not spend a fortune, it is possible to find some good, quality wooden swing sets under 500 dollars. 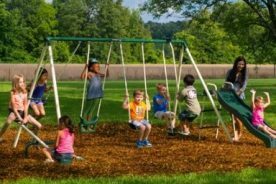 These lower-priced swing sets might not be the largest sets you can find or include all of the accessories that some of the bigger sets have. However, the top 5 that we have detailed below come from some of the top trusted brands and are still sure to provide a safe and fun activity for your backyard. They include some of the staple swing set features that kids love such as swings, a slide, a rock climbing wall, and even a covered play deck. 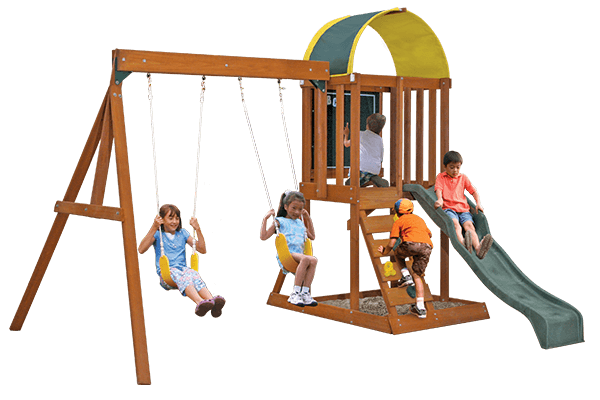 The Appleton swing set by Big Backyard includes many of the popular features of a large swing set, but in a smaller size. The upper fort is sized nicely for a couple kids and includes a large canopy that offers plenty of head space. Inside the clubhouse is a built-in vinyl chalk board so kids can draw to their hearts content. A climbing rock wall has been combined with a ladder to access the fort. A sandbox is located under the fort. The Appleton only includes two swings. Swing sets by Big Backyard are made from 100% cedar lumber. The wood comes pre-cut and pre-drilled for quick and easy assembly. Two adults assemble the play set is 4 to 8 hours. The wood is pre-stained for appearances only. Up to seven kids can use the swing set at one time so it is great for larger families or a family with lots of neighbor friends. 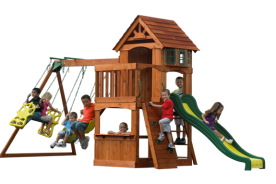 Another reliable swing set brand, Backyard Discovery is committed to providing affordable and high quality backyard play sets. They have been in the swing set business for more than 40 years. Their products are known to be sturdy, long-lasting, and super safe. 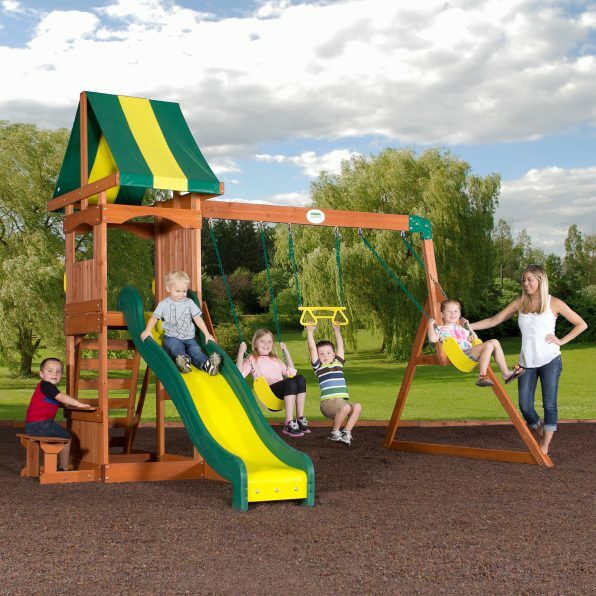 The Weston is one of their smallest models but sill includes a fort area for kids to play, multiple swings, and rock wall/ladder combination to maximize its playing ability. 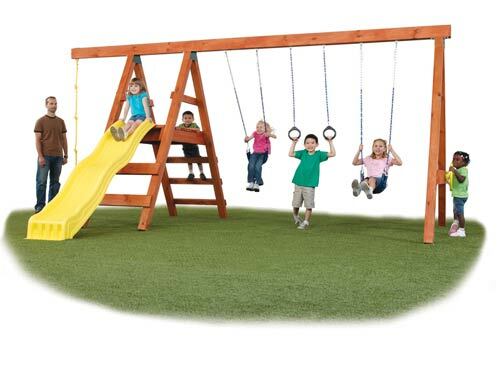 Great for building imagination, this small swing set even includes an area for a sandbox. 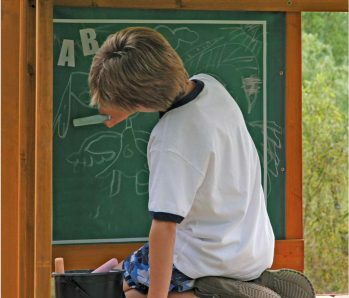 The built-in bench adjacent to the snack stand window allows kids to rest, enjoy a snack, or pretend they are serving ice cream on a hot summer day. Backyard Discovery’s signature green and yellow slide is speedy yet safe. 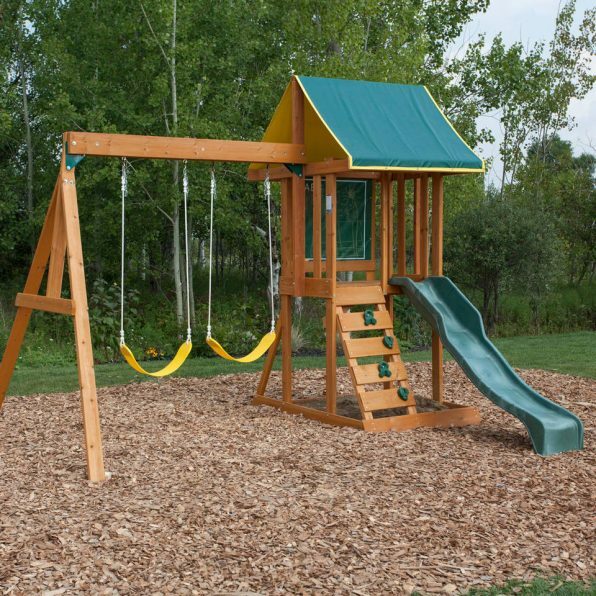 When you purchase this swing set you will get everything you need for construction including the all-cedar wood that is already pre-cut, pre-sanded, pre-stained, and pre-drilled. All of the hardware is included along with a detailed instruction manual for do-it-yourself assembly. 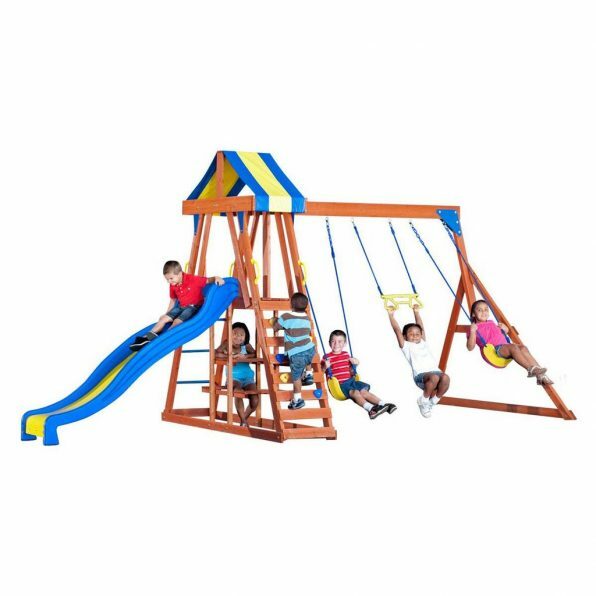 Similar to the Weston in size and features, the Yukon by Backyard Discovery is another excellent swing set at an affordable price. It features both a snack bar and a sandbox, but instead of next to each other, the snack bar is located inside the sand area. The clubhouse is smaller than the Backyard Discovery Weston. It does still include great features such as swings, trapeze bar, slide, and rock wall. 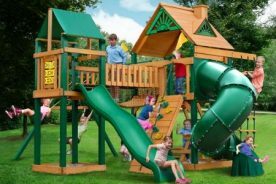 As with all Backyard Discovery playsets, the Yukon III is made from cedar wood that is naturally resistant to rot, decay, and insects. The Safe-T-Fuse hardware ensures a secure assembly that is easy and quick. The lumbar arrives pre-cut and pre-drilled to expedite construction of the playset. With two people working plan on assembly taking about 18-24 hours. This swing set is best for families with a small backyard and younger kids. Backyard Discovery makes it easy to swap the swings. You can switch the belt swing to an infant or toddler bucket swing or even a glider. Another cool option from Cedar Summit, the Ainsley is a smaller, wooden swingset that may not have a ton of features but will provide just the right amount of fun for your family. And as far as prices go, for an all cedar swing set this set is a great deal. Its unique arched canopy roof makes it an attractive option for your backyard as well. When you order this swing set you can be assured you will be getting a quality product that is durable and has your kids’ safety as a top priority. Even the stain that is used on the wood is child safe. And since Cedar Summit prides itself on making their products easy to assemble you will also get all of the parts, lumber, and hardware you need for assembly. The lumber is all pre-cut, pre-drilled, and pre-stained for your convenience. Read on for more details about the included features, size, and where to purchase the Cedar Summit Ainsley. This next wooden swingset under 500 dollars really looks like a steal until you read all of the details. When you purchase this product you are actually only purchasing the kit and accessories, there is no wood components or hardware included. For those who are handy and comfortable using power tools the Pioneer Deluxe Hardware Kit is probably a great option. You can spend as much or as little as you want my choosing the type of wood that fits your needs and your budget. If you aren’t a handy person you may want to avoid this option as the time and energy you put into measuring, cutting, and building might not be worth the savings. 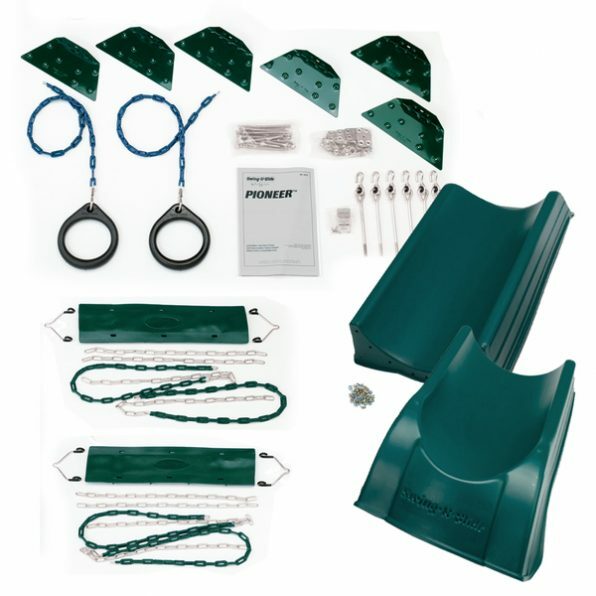 When you purchase this kit from Swing-N-Slide, you’ll get everything you need for basic assembly including the brackets, swings, swing hangers, and in some cases the slide. All of these parts are made of durable plastic and steel. The rest of the durability depends on the wood you choose. Another perk of this model is that you can choose from 4 different swing set configurations as you build to make it fit perfectly in your available space. No matter which kit you buy from this brand, you’ll get a detailed instruction manual as well as a list of what lumber and tools you’ll need for completion. See below for the list of lumbered required for this particular set. When it comes to choosing an affordable swing set, wooden playsets do not have to be crossed off the list. While you may have to sacrifice some size or a certain number of accessories, it is possible to get a well-made, durable wooden swing set that your kids will love for under 500 dollars. These are just a few of the many models available and we hope this list gives you a good place to start on the path to finding the swing set that is perfect for your family.